"The platform comes with the LIS331DLH preinstalled on the board, but can support any digitaloutput accelerometer from ST in 3×3 or 3×5 mm packages connected to the microcontroller through an SPI interface, as well as the LIS344ALH analog-output accelerometer. 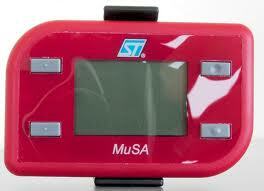 The MuSA platform features four buttons for navigating the menus. A mini-USB connector is available to exchange data with a PC, depending on the specific application, and also recharges the internal Li-ion battery. The battery is capable of providing power for approximately 7 hours of operation."